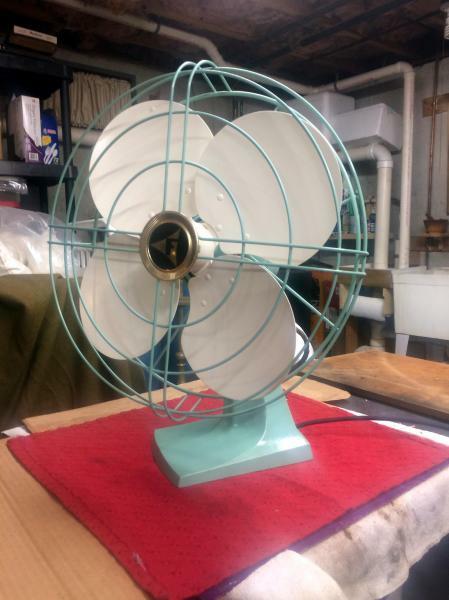 AFCA Forums > Antique Fan Collectors Association > Post-1950 (Vintage) > Who made this funky dime store fan? Friends: My cousin gave me this fan some time ago and it sat in my basement until I got around to working on it. It didn't run because the switch was missing. I replaced the switch and fired it up and the blades barely moved. I opened the gear box to see what the story was and the grease had solidified to the point where I had to chip it out. It looks plastic but it is made of aluminum I believe. There is a big F on the badge (that stands for FASCO Industries). Can anyone help to date this dime store fan and tell me something about the company that made it? Now that it is fully restored (and those are the original colors which have been re-applied) it runs perfectly well at all three speeds with a very slow oscillation. It's almost silent at the slowest speed. I'll find some deserving young college student (maybe my god daughter) who may want it for her room. Fasco started with one manufacturing plant in Rochester, N.Y. in 1911. Today, we employ over 5,000 individuals in 13 facilities across North America and Asia Pacific and are continually increasing our capabilities on a global scale. I had never even heard of this company and I went to school in Rochester NY! FASCO has been around for quite some time. One of our former members (now deceased) worked at one of their Missouri factories for many years. Generally FASCO fans are better than dime-store. I am not sure but would date your fans to the late 1950's to possibly the early 1960's. When I was a kid, our church in Maryland had several of these, 16-inch versions that were all wall-mounted in a large room in our education building. (As a kid, I used to think the "F" stood for fan - LOL) I know the fans at church were there in 1970 and were still there in 1985 when we moved out of state. The all operated just as you said - they moved a lot of air very quietly. Thanks Dave. Interesting information. I meant no offense with the "dime store" label. 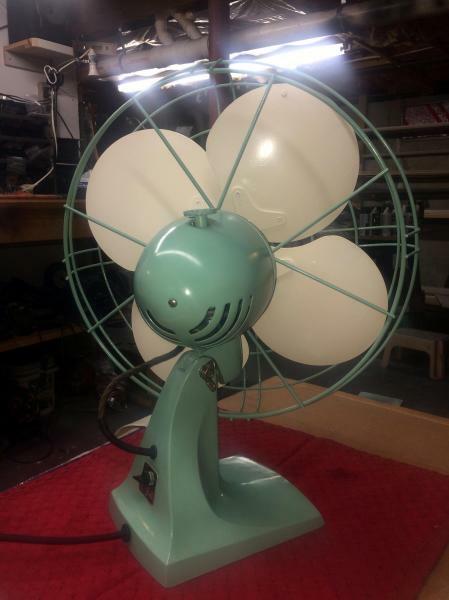 This fan is certainly well made and I enjoyed working on it to bring it back to life. I'll find it a good home. Those are very high quality fans for the time period. Like Dave said yours is very late 50s to early 60s. I have one exactly like it which belonged to my wife's grandmother. She bought it in "65. 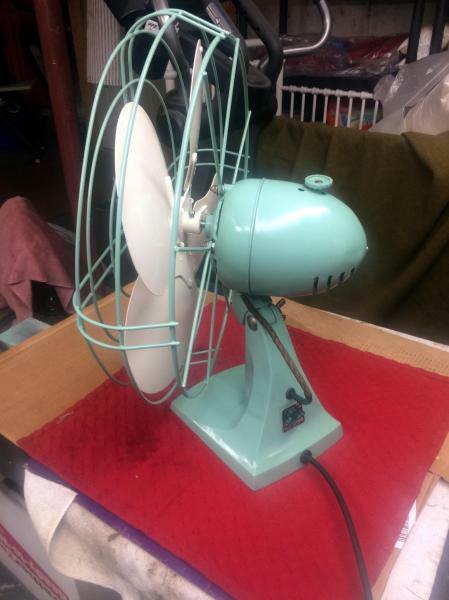 It is rebranded Montgomery Ward, but is the same fan. Yours looks to be in incredible shape. Thanks Stan. It was in sad shape when I got it and it sat for the better part of a couple of months before I got around to working on it. It took easily five hours to bring it back to life. The paint colors I used were an exact match to the original colors. Someone had carved their initials (WSS) into the base with a letter opener or something else very sharp. I sanded it down and all but eliminated that ugly mark though it is still barely visible. Other than that and the missing switch, the fan was in remarkably good shape. Wow, you did do well on the color matching then. I have the same fan with a later OSHA guard and didn't realize yours had been repainted. Page processed in 0.1584 seconds (18% database + 82% PHP). 27 queries executed.